Charles was easier to manage in his own home space, but we still had to stop for snacks and taking care of the babies. We even stopped for lunch. Tabatha was making great time! We took a break so she could get Charles down for a nap. He slept for a long time! We also had to take lots of potty breaks for Spencer. I liked the wax in the tub best. Really, for thinner hair it kind of needs something a bit more grabby, like if the teeth on the metal comb had tiny metal sandpaperish bumps. The metal comb worked best for roots, plastic comb for the body. Then back to the metal comb for the tips. Even making great time, we were getting close to my husband's bed time. (He works very early hours.) I was going to have to leave. When I left at 7 o'clock, I only had 5 sections (already divided) in the very front left to backcomb. We agreed we'd get together again on Friday if I couldn't dread them myself. There had been 1 section that Tabatha had root-dreaded last time that I dreaded myself, so I was fairly confident that I could do it. I just could not let it go. That night I went to work on my remaining 5 dreadlocks. I wish I had gotten Tabatha to do the roots, but we really were out of time. Working on the hair on the top of your head is exhausting! I kept having to take breaks, but I managed to get the last 5 locks dreaded by midnight! I preferred the tub wax for any pre-backcombing issues. I also preferred the plastic comb overall, but found that my roots didn't hold up at all. I really wish I had Tabatha do the roots and I may have her help me fix them at some point. The plastic comb has a ruler on the back side. That was handy for sectioning my hair. 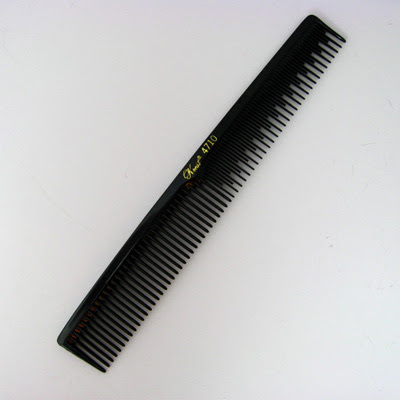 As far as holding onto a comb with waxy hands, I also preferred the plastic comb. 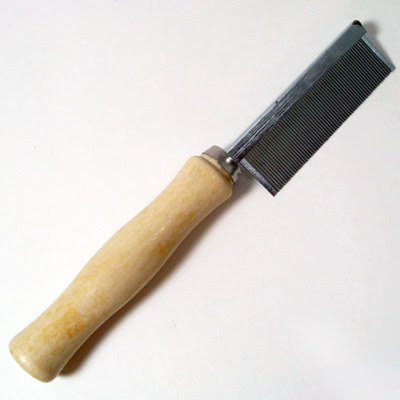 The metal comb has a nice wooden handle, but it just makes too much contact with my hand for the situation. Your mileage may certainly vary, especially if you don't need product in your hair for backcombing. Tallying up time dedicated to this new do: 5 hours for my first Dread Party, where I mostly had 2 helpers. 8 hours for my second Dread Party, with only 1 helper. And then 1 additional hour on my own. That is 14 hours, just to get the locks dreaded in the first place! I have 64 dreadlocks! I'm excited to have a number, but am also a bit intimidated by the thought of palm-rolling 64 dreadlocks. I am so pleased to be reviewing Knotty Boy natural dreadlock care products as well as their easy-to-follow system. The short videos were very helpful. It took a lot of trust to have two people do such a permanent thing to my hair. Yes, it can be undone, but after 14 hours, who would want to undo it?! So tune in next week to find out about shampooing my dreadlocks! I will also be discussing my dreadlock maintenance... on all 64 babies. Looks awesome! I ended up with 'real' dreads in my short stubby hair and I'm just going to keep them rather than trying to get them out. I love having to do so little work for upkeep once they're done! Cool. Been thinking of locking my hair for a while so looking on with interest at your process. I wanted to do it for years! No pictures yet, but once I let them loose I'll post about it. Thanks and congrats on your new dreads! In fact, everything on this website is significantly better for your hair and dreads AND cheaper than Knotty Boy products. Plus, it's all hand-made and organic. Rob - the choice to use a wax product or not is a personal one and while there are lots of opinions on both sides of the coin, we can all agree that there are lots of ways to accomplish great looking dreads. I'm sorry if you had a bad experience with wax, but we have the testimonials of hundreds of thousands of people who have used Knotty Boy wax (and other products) to achieve, healthy, beautiful dreads. Our wax is designed to completely wash out when used properly, so no need to worry of 'candle sticks' or any other wax related issues that can happen with some other wax products. 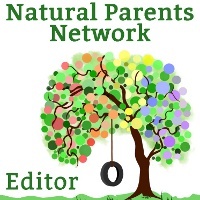 If you have questions about Knotty Boy products, their ingredients, or uses I'd be happy to help! Email me at customerservice@knottyboy.com! I can tell that this Knotty Boy wax doesn't stay built up in my hair. It seems just enough to hold my hair together, but with this Summer heat and my showers... I have to reapply or it would be entirely gone already. I've seen where some people use wax and some don't. My straight hair won't even hold a perm, so I felt like I needed some help holding it together.